Today we welcome a guest post by Sharon McConnell-Sidorick, author of Silk Stockings and Socialism: Philadelphia’s Radical Hosiery Workers from the Jazz Age to the New Deal. The 1920s Jazz Age is remembered for flappers and speakeasies, not for the success of a declining labor movement. A more complex story was unfolding among the young women and men in the hosiery mills of Kensington, the working-class heart of Philadelphia. Although the young people who flooded into this booming industry were avid participants in Jazz Age culture, they also embraced a surprising, rights-based labor movement, headed by the socialist-led American Federation of Full-Fashioned Hosiery Workers (AFFFHW). In this first history of this remarkable union, McConnell-Sidorick reveals how activists ingeniously fused youth culture and radical politics to build a subculture that included dances and parties as well as picket lines and sit-down strikes, while forging a vision for social change. In the following post, McConnell-Sidorick offers an introductory history of the flappers and “street-fighting women” socialists of the 1920s Philadelphia hosiery workers’ union. One phenomenon of the recent election cycle—both during the Democratic primary and in the aftermath of the general election—has been the rapid and unexpected growth of socialist organizations and interest in socialism in the United States. This is one of the more notable elements of the “Resistance” that has brought unprecedented numbers of people into political actions like the Women’s March. The surge in interest in socialism has been so strong that pundits near and far have begun to write about the “sudden” appearance of millions of socialists in America. But there is a rich history of socialism in America that has shaped the country in important ways, not least for women. It is, however, true that many of America’s youth have not learned that history. Pushed out of the mainstream consciousness by Cold War rhetoric, knowledge of socialism has been forgotten, or diluted and subjected to revisionist interpretations. A look at the history of some young socialists in the 1920s and 1930s, especially young women activists, who faced very similar problems to those of today yet built a successful movement to confront them, may help provide insights for today’s fledgling socialists. 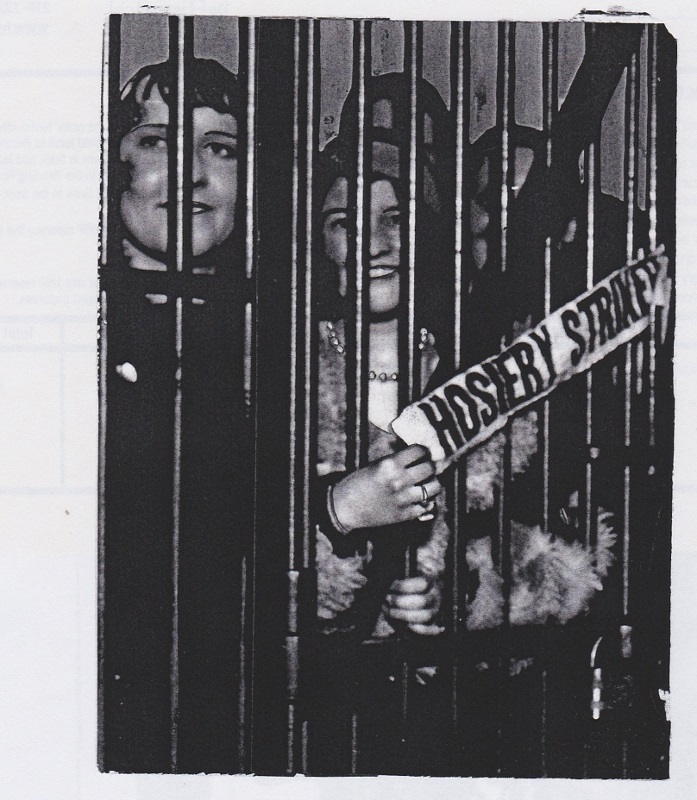 Women strikers in Jail, Open Shop Strike, 1931, Philadelphia Record Photograph Morgue [V07] Historical Society of Pennsylvania. Far too often in history, participants in radical movements are seen as somehow different from the general population of “regular” people. But if a movement is to become a successful one, the involvement of those regular people is, of course, an absolute necessity. The most successful movements occur when ordinary people begin to believe that they can make a difference, internalize a vision for change, and have the organization and leadership available to put that vision into action. In 1920s Philadelphia, workers in the city’s largest industry struggled for dignity and a better life, as many others had been doing there for generations. But there was something different about these workers. The product of their industry was silk hosiery, the iconic fashion item of the flapper culture then sweeping America and the world, and the overwhelmingly young women and men who worked in the hosiery mills were enthusiastic participants in that culture. Wearing short dresses and bobbing their hair, the women, along with their male compatriots, drank bootleg gin, danced the “Black Bottom,” listened to jazz music, and even attended “necking” parties. Yet the side of 1920s culture that most resonated with these young workers was its rebellious edge, and they quickly learned to incorporate that rebelliousness in their dealings with their bosses, soon becoming fervent and militant unionists. Unlike most unions across the country experiencing sharp decline in this period, theirs was a vibrant and growing one, led by imaginative yet experienced left-wing Socialists and a few Communists. In a masterful fusion of youth culture and radical politics, the American Federation of Full-Fashioned Hosiery Workers (AFFFHW) built a movement that not only swept Philadelphia, but helped to change the very face of America. The aftereffects of World War I joined the swirling currents of modernism in convulsing 1920s American society, particularly its youth. In the face of growing popular fascination with a booming stock market and “business,” progressive movements struggled to find continued relevance. But the 1920s was not only a period of capital expansion, bootleg gin, labor retreat, and apathy; it was also a time when gender relations were in flux, as ideas about sexual and gender equality and more complex notions of identity, work, and women’s rights entered into popular culture. They partnered with the Public Works Administration to build the first path-breaking New Deal housing project, which opened with a fully staffed nursery school for the children of working mothers. On closer examination, we find within the decade a “seed” period of local organizing, education, and international networking, when the groundwork was laid that provided the basis for the explosion of social justice and labor activity that became a part of the Congress of Industrial Organizations (CIO), the New Deal, and their legacies. These developments were exemplified nowhere better than in Kensington, the home of the AFFFHW and the working-class heart of Philadelphia. And young women, who had flocked into the industry during a major expansion in the 1920s, were central players in the AFFFHW’s movement. The hosiery union’s struggle was not easy, but its actions and impacts were far out of proportion to the size of the organization. When the early New Deal’s National Industrial Recovery Act (NIRA) promised workers the right to union representation, hosiery workers led the first massive wave of organization strikes in the nation and developed the “Reading Formula,” the dominant blueprint for labor settlements under NIRA. They went on to be leaders in the sit-down movement after experimenting with “strikes on the job” years earlier; they partnered with the Public Works Administration to build the first path-breaking New Deal housing project (which opened with a fully staffed nursery school for the children of working mothers); they played a central role in the founding of other major CIO unions; and they were responsible for rescuing labor from the Sherman Anti-Trust Act in a precedent-setting Supreme Court case. All the while holding aloft what became their signature banner, not the well celebrated image of a muscular white male, but an image of a young “modern woman,” uplifted arms holding union-made hosiery, above an art deco background of the sun rising from the industrial city. But women’s concerns were not confined to their needs as workers, and the union, with women in the forefront, also embraced such important issues as birth control, childcare, and female independence. As the 1920s descended into the 1930s Depression, community organizing—stopping evictions, providing food and clothing—also took on added significance as women, along with male co-workers, became defenders of the community. Several hosiery workers were killed during their strikes; after their first loss of a 22-year-old member to gun thugs hired by the manufacturers, their community responded with an angry demonstration of over 35,000 people. 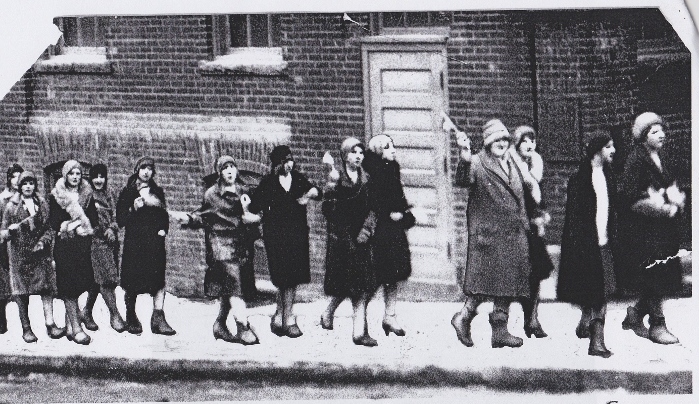 Women picketing Kramer Hosiery Mill, Kramer Strike, 1931, Philadelphia Record Photograph Morgue [V07] Historical Society of Pennsylvania. The hosiery union leadership acted locally but thought globally, building regional, national, and international networks. They patiently built a radical subculture that drew on popular culture, dances, and parties, as well as picket lines, political education, and strikes. Key to their success, however, was their vision—that a better world was possible and that “ordinary” people could organize around a concrete plan of action to achieve that world. At a time of deep pessimism, AFFFHW activists offered a positive socialist vision that sought to unite people across the differences of race, gender, age, and ethnicity, to construct a society predicated upon justice and human rights, political and economic, for all. The young socialists of Kensington’s hosiery mills, with women often in the forefront, embraced that vision, transforming their lives as they fought for a new world. Sharon McConnell-Sidorick is an independent scholar and lives in the Philadelphia area. Silk Stockings and Socialism: Philadelphia’s Radical Hosiery Workers from the Jazz Age to the New Deal is now available. Visit her author page at uncpress.org for information about upcoming book events. Follow her on Twitter @SMcCSid.